I remember the day the Mall of America opened. It was the place to be when I was in high school. Over the years I have watched stores, attractions and restaurants come and go. 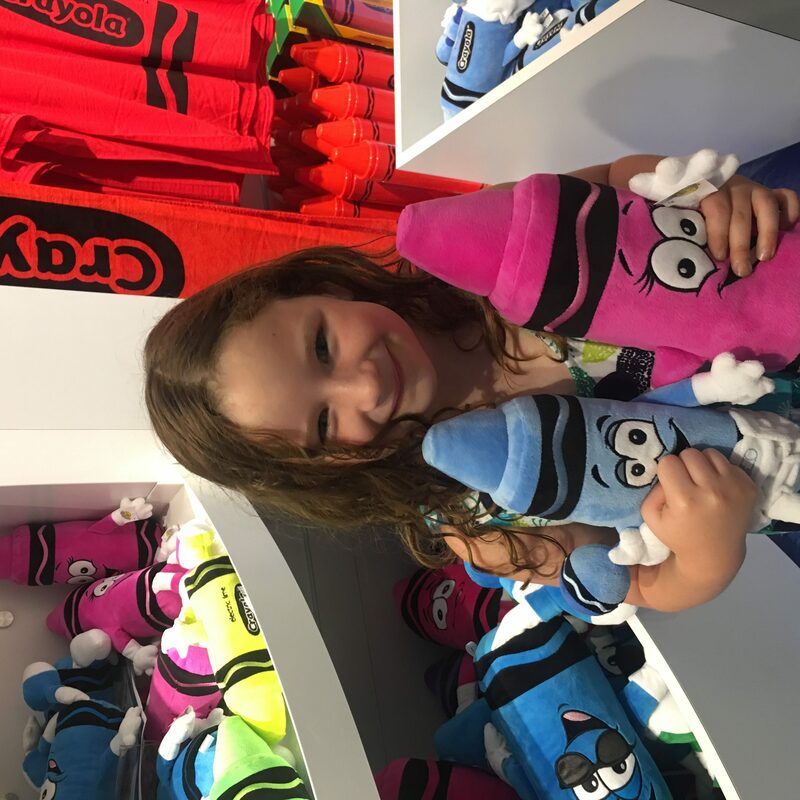 This past spring, the Crayola Experience debuted at the Mall of America where Bloomingdale’s used to be located. There are two other Crayola Experiences in the United States, Orlando, Florida and Eastan, Pennsylvania. I think it’s pretty neat to have one here in my home state. Crayola has always been a staple in our home. Over the years we have gone through countless cartons of crayons, colored pencils and markers. The jumbo coloring sheets are a treat for us to color. And the day I discovered wonder markers was a day to celebrate! Fabric and parents around the world thank Crayola for that invention. Going the Crayola Experience is not something you want to rush through. I suggest you arrive when the exhibit opens so you have plenty of time to play and experience everything. We arrived bright and early on a Saturday morning. There was already a little crowd gathering to get in. 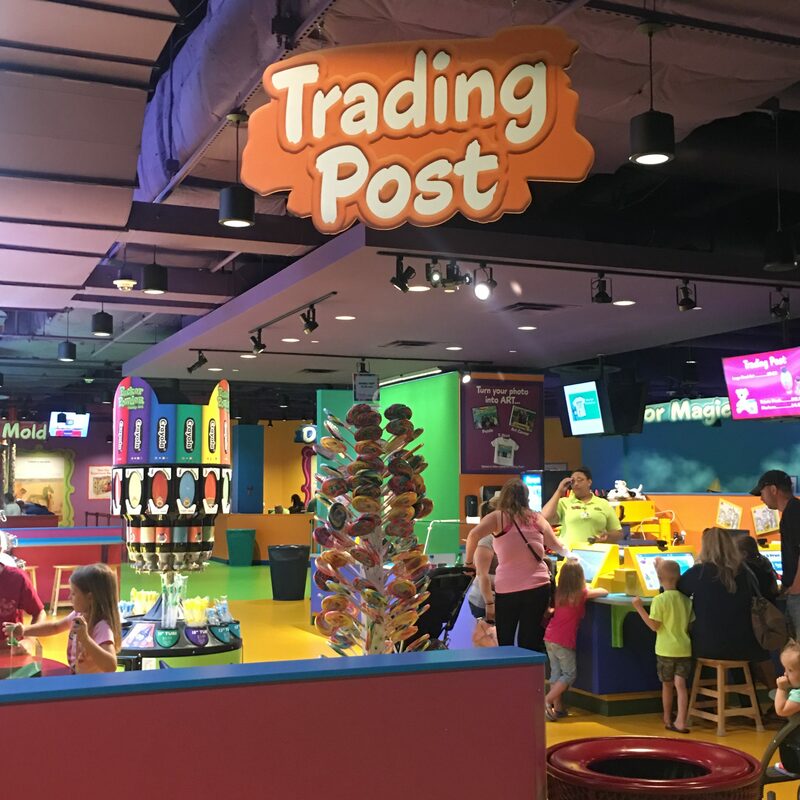 When you first enter the Crayola Experience you are greeted with bright colors and cheerful staff. You’ll wrap through the line until your turn at the counter, there you’ll pay for your entrance and receive 2 tokens to use throughout the experience as well as a bag for your treasures you’ll gather along the way. Depending on party sizes and amount of available staff this part can move a tad slow. 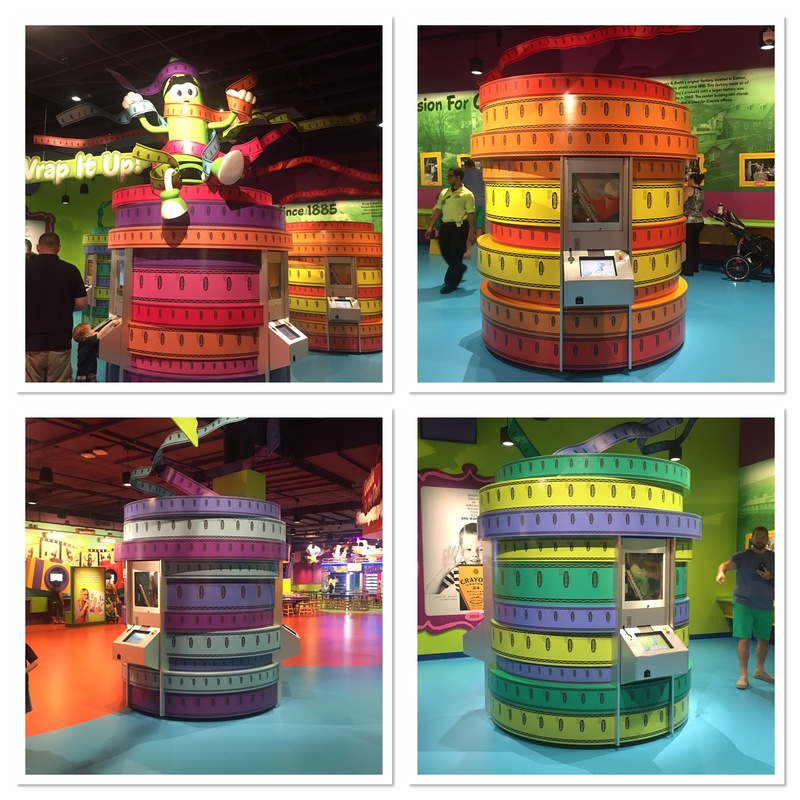 Once you enter the experience the first thing you will see is 4 large, colorful cylinder machines. This is where you are going to use your first token. Here, you get to design your own crayon wrap, name your crayon and wrap it! Peyton and I had a blast with this. Each machine has 3 different colors you can choose from. Once you’ve chosen your crayon you get to start designing the wrapper. With over a dozen symbols to choose from, it may take you some time to choose. Then you have to think of a name for your crayon. Once you’ve made all those choices it’s time to print the label. Now you have a label and a crayon, it’s time to wrap it. Wrapping the crayon was one of Peyton’s favorite thing to do. Next, we made a coloring sheet staring Peyton! It’s like a picture booth. You have several different backgrounds to choose from, then you can take a picture of yourself and insert it into the background. With Crayola magic you’ll become part of the coloring page! 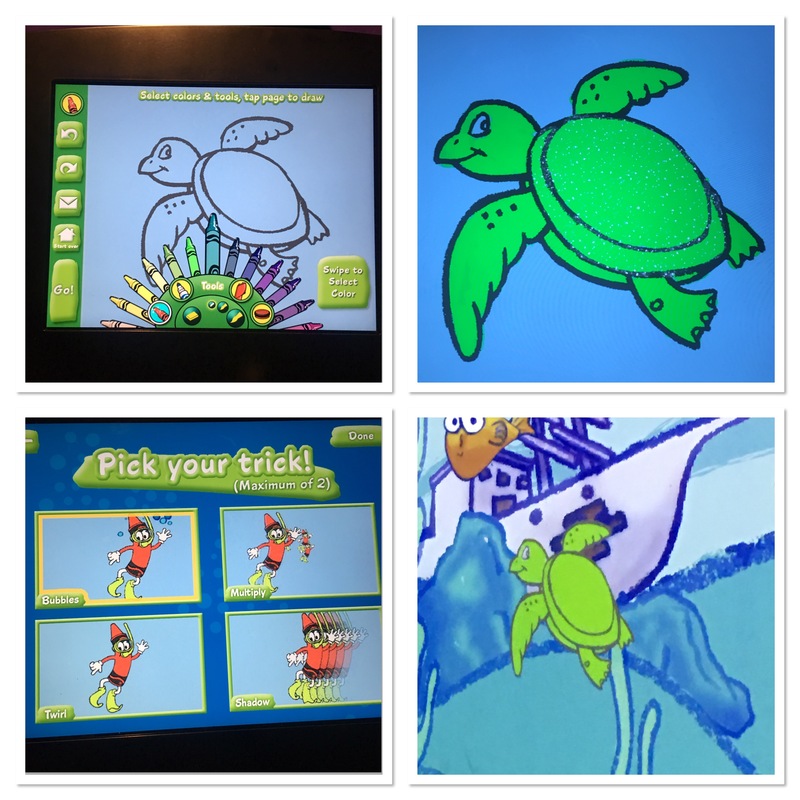 If the other exhibits are starting to get crowded there is a humungous coloring carousel you can take a break at. It’s fully stocked with Crayola crayons and coloring sheets. This is a great place to take a break and try out some new types of crayons. We tried out a whole bunch of metallic crayons that we’ve never used before. Once we colored our pictures, we felt it was time to keep moving. There was a lot to see and experience. We had already been in the place for an hour but it felt like only a few minutes. Next up, modeling clay! Can you believe that before today I had never used modeling clay? I hadn’t. This is where you will use your second token. There are these vending machines filled with modeling clay, your token will enable you to choose one packet. Peyton and I could not settle on one color so we ended up purchasing one of each color. Each additional packet was $.50. So for a few more dollars we had every color available to sit down and start creating something. Peyton recently learned about combining two colors to make a new color. So she spent a fair amount of time creating new colors while I created a rose. I also learned that modeling clay never dries out! That made me want to go out and buy a whole bunch of modeling clay. Once we were done creating new colors and roses we wandered over to the Art Alive exhibit. I had never seen this before and I wasn’t sure what we were going to do. The room was full of screens and people were going to town coloring on them. So we sat down, chose a shape and starting coloring. It reminded me of a game Peyton has on my cell phone. Then when we were finished coloring it was time to give our shape some character and send it off to the wall! Whatever you create ends up coming to life on the wall in the room. I made a sparkling green turtle and gave him bubbles. Now we had really worked up an appetite so we stopped in the cafeteria area for a bite to eat. 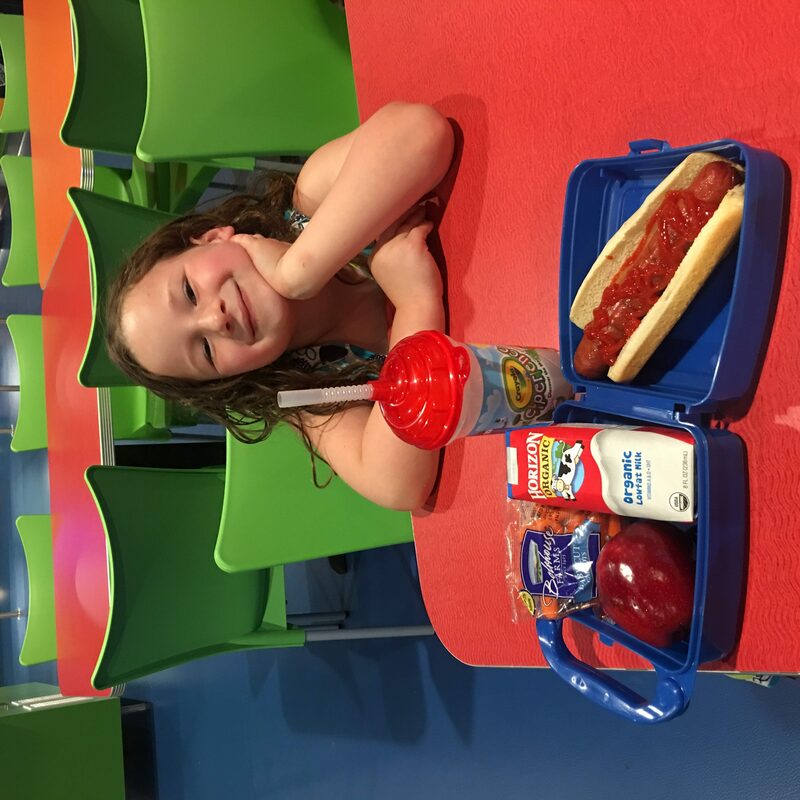 The kids meals are adorable! You get to choose from a red or blue Crayola box. Peyton chose a blue one and then filled it with a hot dog, baby carrots, apple and milk. The kids even get a Crayola collectible sipper! After Peyton had eaten and recharged we headed off to see what else we could do. To my surprise, we were not even half way through! There is just so much to do. 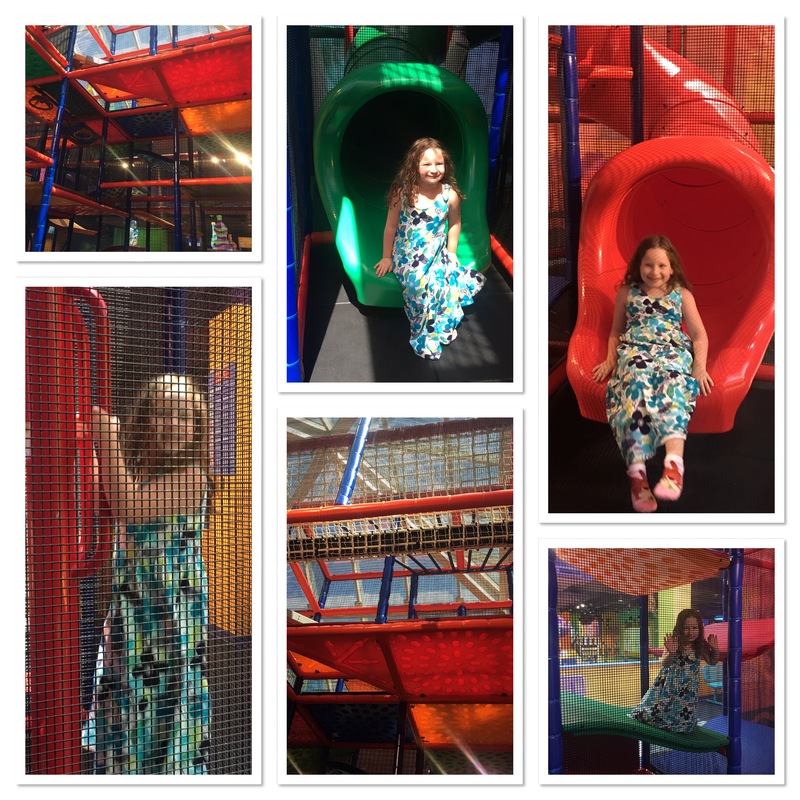 There are even two indoor play areas, one for toddlers and one for bigger kids. Ofcourse, Peyton had to take try them out. Next up, melted crayons! Who hasn’t wanted to melt crayons and make art with them? Well, Crayola made a whole exhibit with tables full of wells filled with melted crayons! 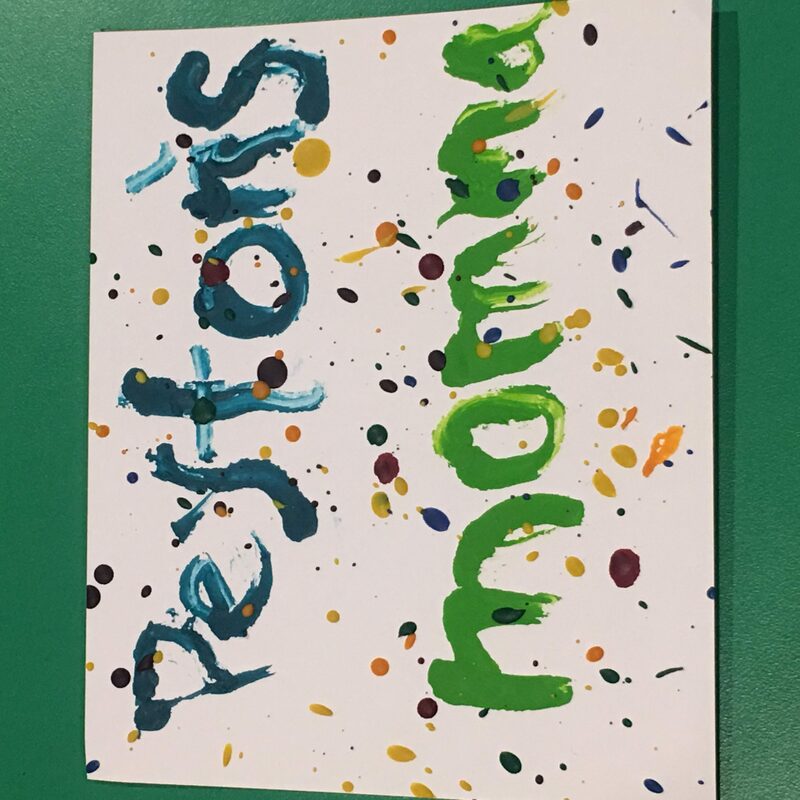 I decided to make a little Peyton’s Momma sign with the melted crayons. Peyton filled a piece of paper fill of different color splatters. She had a real good time. 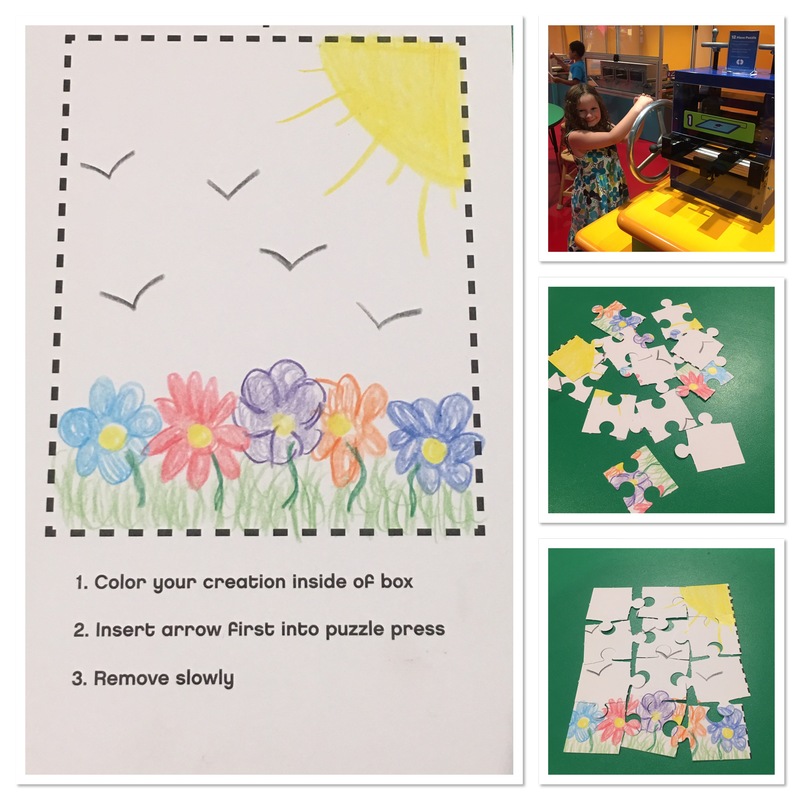 Have you ever made a puzzle? Well, you can at the Crayola Experience. You can free draw any picture you want inside the box. Make an intricate picture or a simple scene like I did. Then you take it over to a machine, insert your paper and crank the wheel. A puzzle comes out the other side! 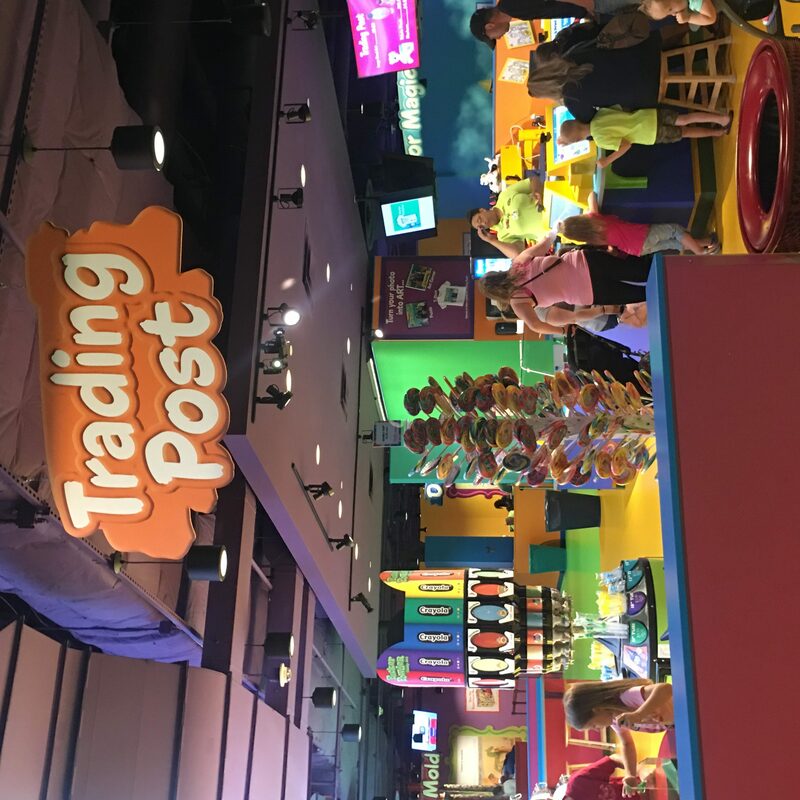 If you need a little pickup, there is the Trading Post and a few vending machines to get your sugar rush on. 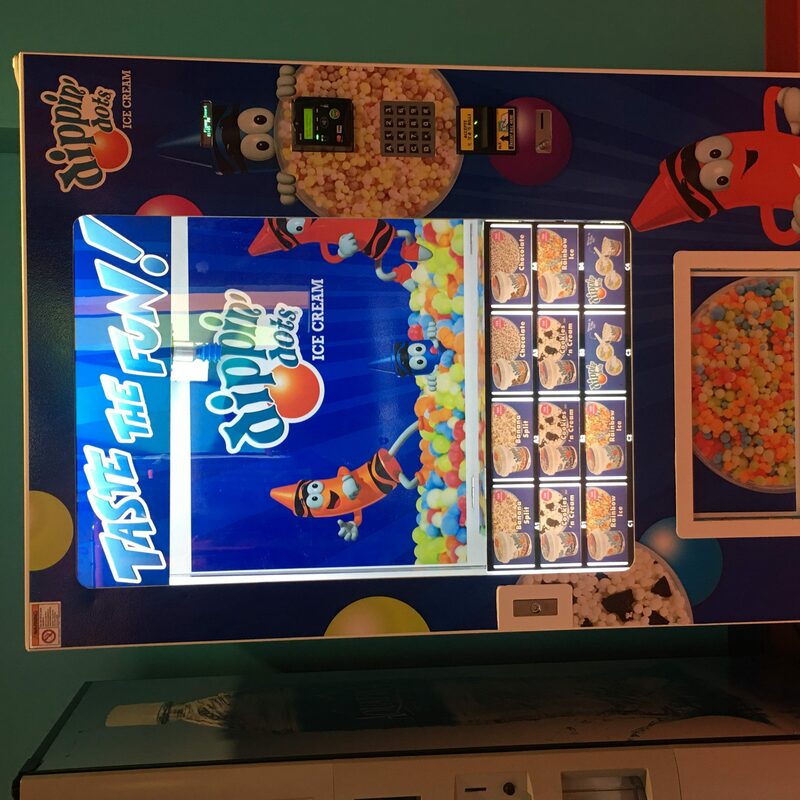 I was seriously contemplating the dipping dots vending machine. Can you believe there is still a ton to do? We did skip over a few exhibits because they were meant for a little older children. This is truly a family friendly attraction. 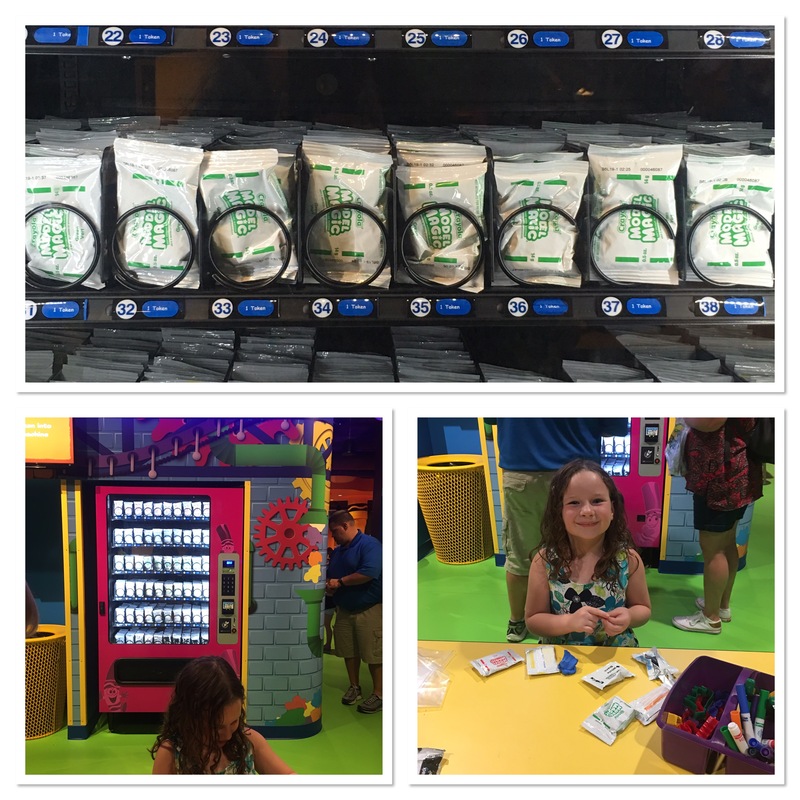 No matter what the age, you are sure to find exhibits that interest you and get your excited to play with Crayola! One of Peyton’s favorite areas was the dry erase exhibit. There are statues the kids can color, trees, cars, dogs and more. And buckets of dry erase markers! It’s like a kids dream. They get to color on the wall and it’s encouraged! 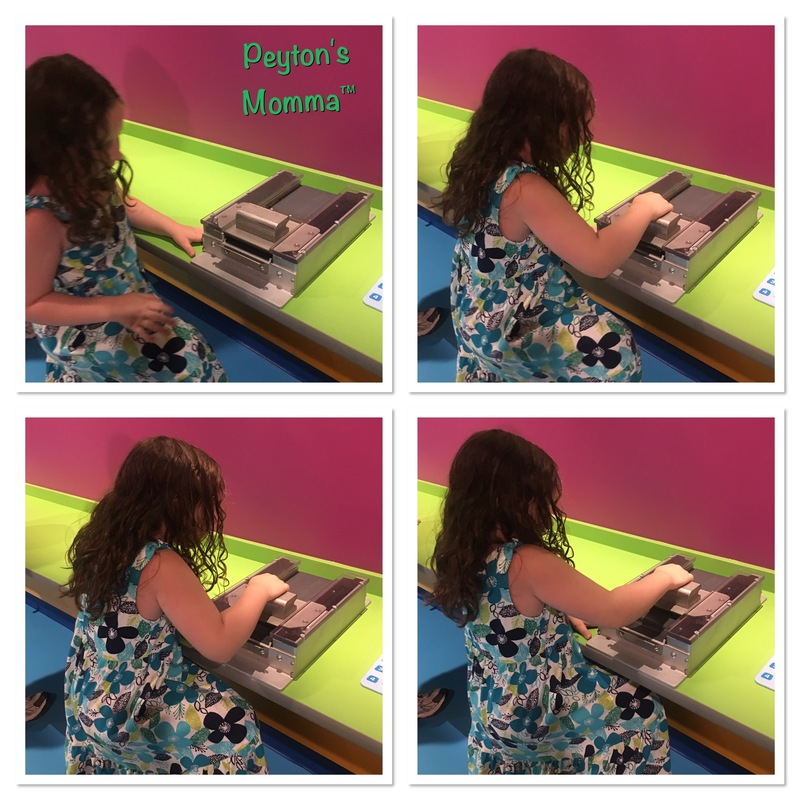 After Peyton had spent, what seemed like forever, coloring I was able to pry her away and move on to the next exhibit. She was excited when she saw we were going to be melting crayons! It’s like spin art with melted crayons. So much fun! You get to choose 2 different colors. First, you insert the crayon into the well. As the crayon starts to melt you can control how fast the paper spins. Then when that crayon is done you insert the second crayon and repeat. Depending on how fast you are spinning the paper you will get different results. I highly suggest picking two contrasting colors for the best results. Our last exhibit was another melting crayon experience. 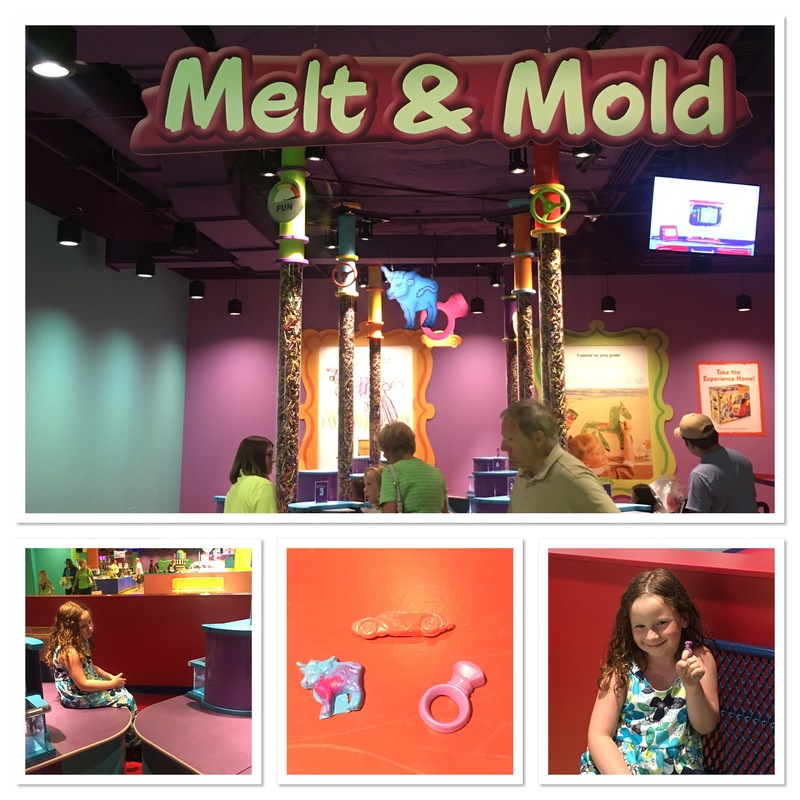 This time, we were melting the crayon and pouring it into a mold! We turned a crayon into a ring, car and ox. This one is a tad time consuming and not much interacting. We had to make 2 decisions and then the staff took over. They asked us which color we wanted to use and which mold we wanted to make. Then they walked us over to a station, inserted the crayon and we sat. And waited. Eventually, the staff came back and took out our creation. 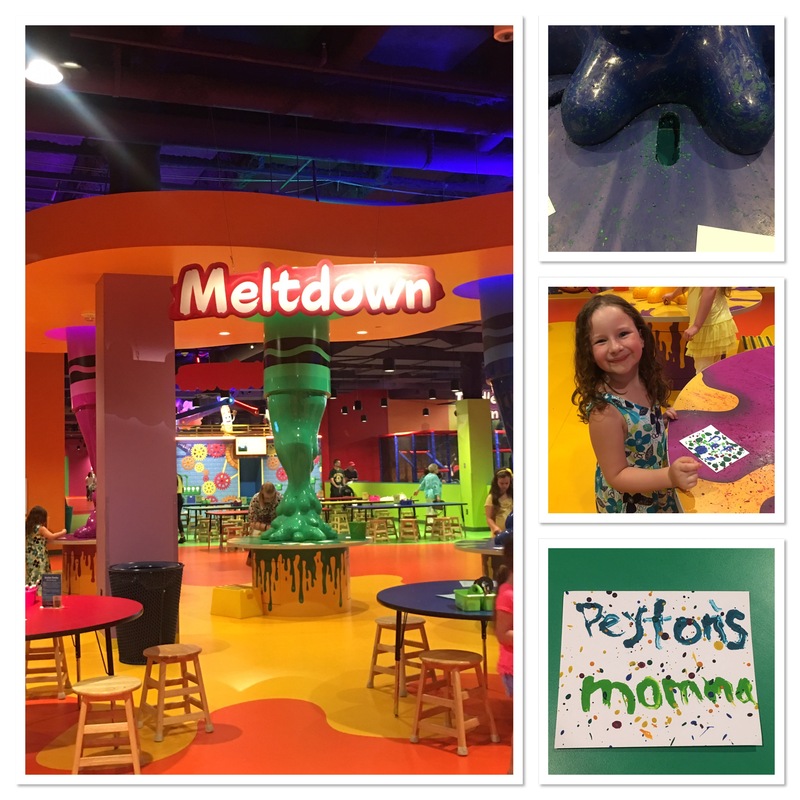 Peyton loved the finished product but waiting was a little much, especially after spending hours at the experience. After we finished in the exhibit we spent a little time in the Crayola store. Wow! 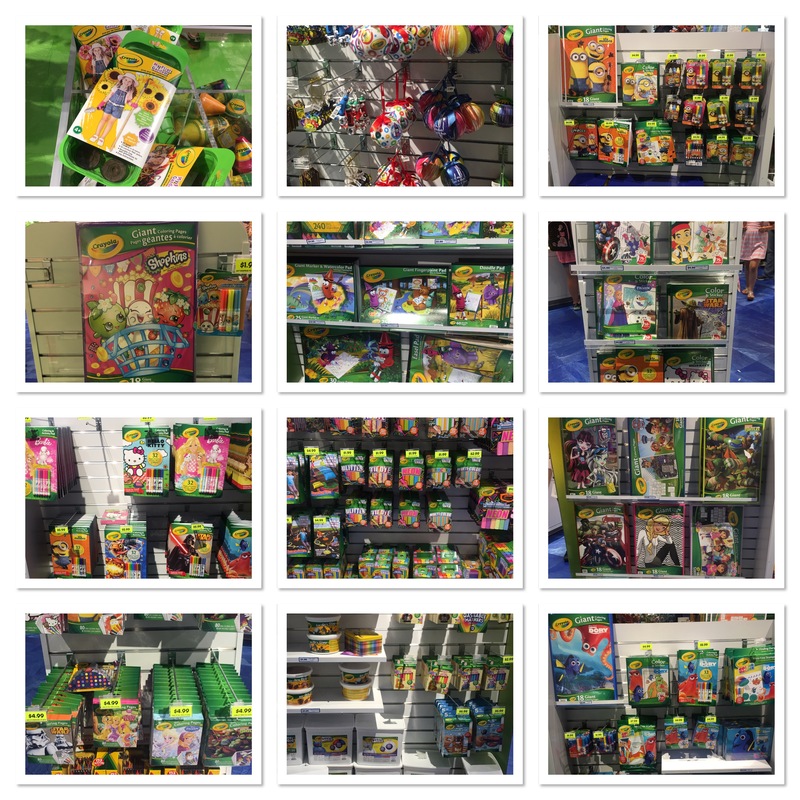 Every Crayola item you have ever wanted was available. And you can come to the store without going through the exhibit! It’s a stocking stuffer dream in here! There were so many things I had a hard time deciding what to bring home. We wandered the store for a while, I wanted to see everything before we made any decision. I ended up settling on a magnet for our fridge (so we could remember our time), a few boxes of specialty crayons, a few items for our upcoming vacation to help keep Peyton occupied on the plane and some coloring books. I will definitely be coming back around Christmas time to pick up some more stuff for stocking stuffers. Peyton really enjoyed herself today. I had a great time too! 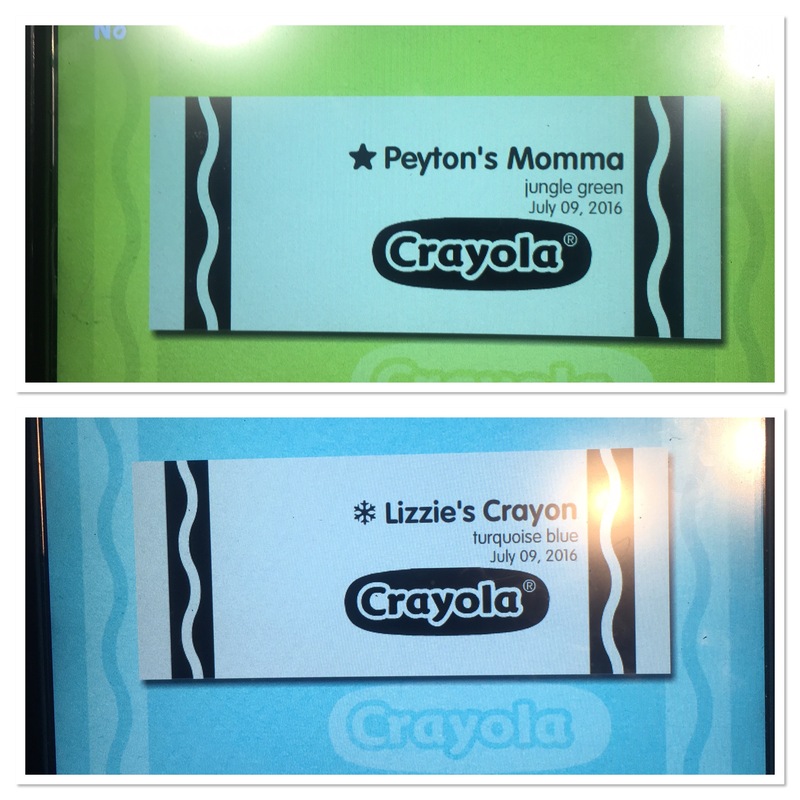 We spent over 5 hours in the Crayola Experience! Can you believe it? We were having such a good time I never even thought we were there that long. 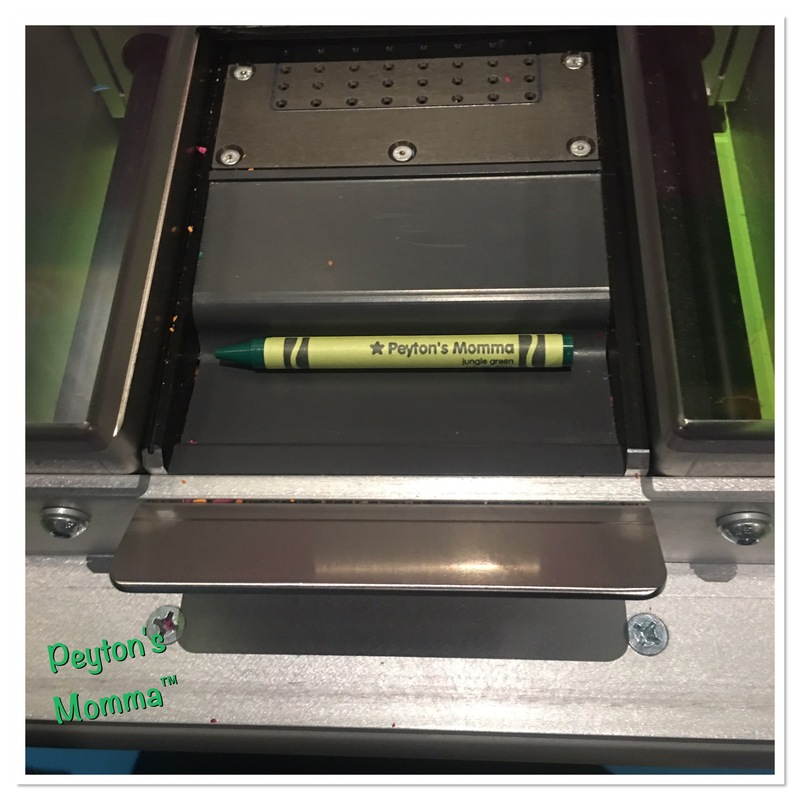 The Crayola Experience is perfect for all families. 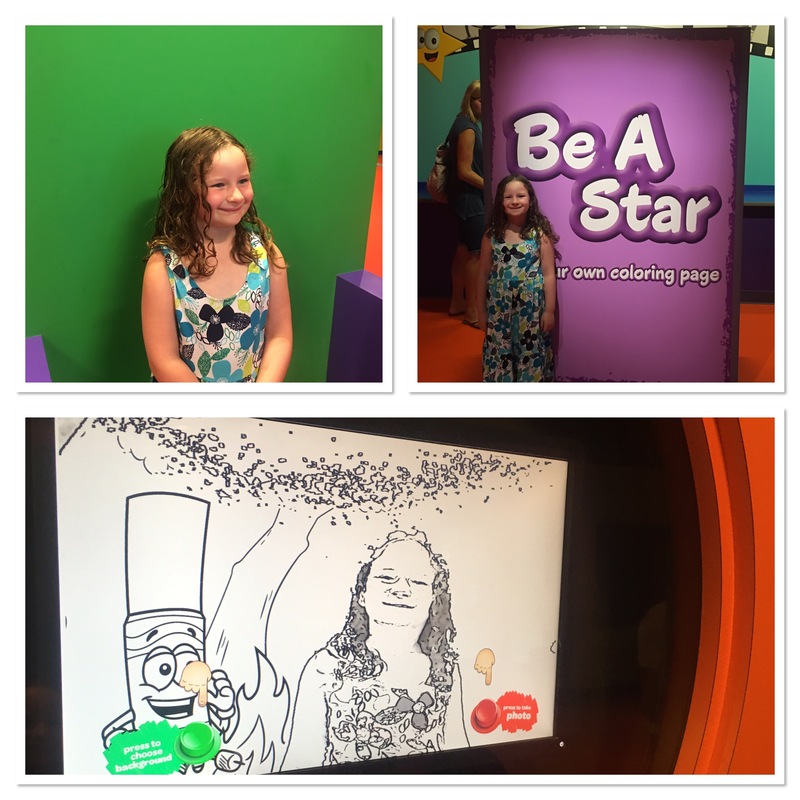 If you are looking for something to escape the heat this summer or take shelter from the frigid temps this winter you should look into the Crayola Experience. And if you live close to the Mall of America and think you will be going more than once this year I suggest getting a membership. 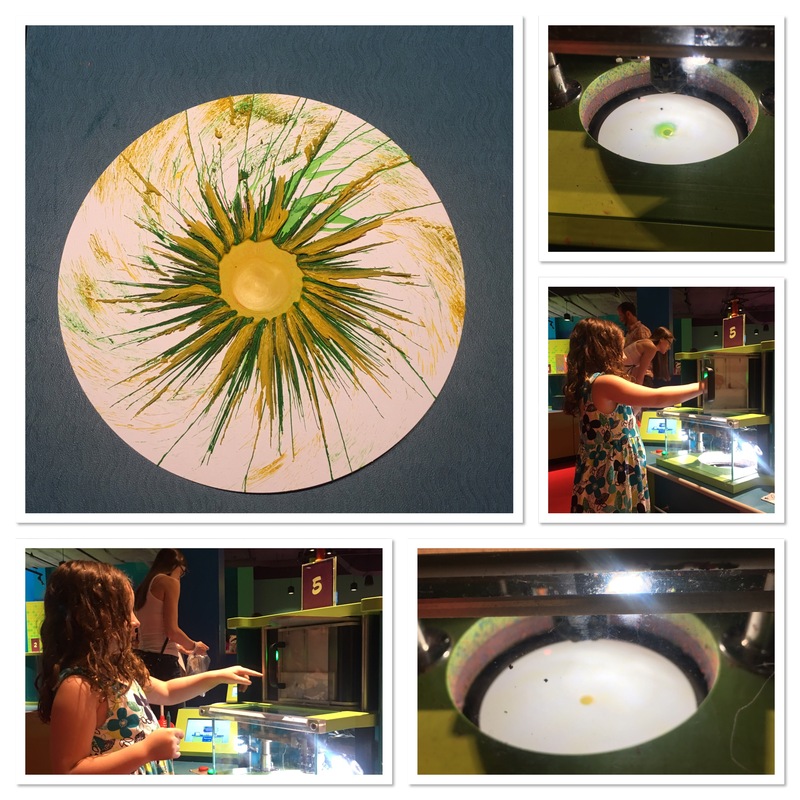 We enjoyed our time at the Crayola Experience and cannot wait to go back. 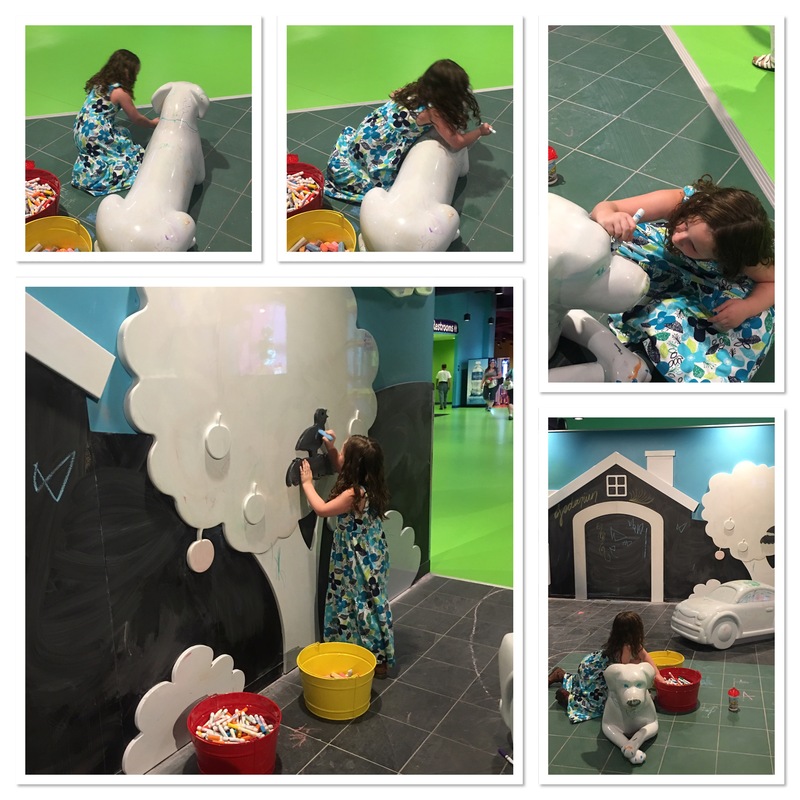 Have you been to the Crayola Experience?